We have a small but noticeable update for our UI. Sometimes you need to add data from Facebook and Instagram together. Sometimes it is for Facebook only. And you had this option before, but now we added a reminder in the "Select Data Sets" menu to show you, which option was selected. You know... Useful to see what were you adding a couple of weeks ago, isn't it? First of all - a new API integration with Quora. Yes, we had a Quora integration before but only as a custom solution provided by a special request. Now we turned it into a more common one and added new report types for it. Finally, there are two new BI and Visualisation tools integrations: Domo and Metabase. Templates and video tutorials for this two will be provided a bit later. Not a bad week at all! And we added Amazon MWS integration with "Payments-All Statements" dimension. ‍Also, we can support two new New Data Storage integrations - Amazon Redshift and Microsoft SQL server. Don't hesitate to visit our integration page for more info. Features? What features? New features? Oh, ok. We have some minor improvements in our monitoring system. And refactored a bit our Facebook integrations to make it faster. Is it a feature, or just a funny useful fact? On this week we have two new API integrations, both on Campaign level: EngageYa and Belboon. EngageYya is a user retention and native advertising platform working with top media houses and premium publishers, actively focusing on Non-English territories and belboon is one of the three leading affiliate marketing networks in the German market. A good addition to Improvado's integrations collection, isn't it? We have added a popup with filters for Yandex.Metrica on this week. Also, we have some backend tweaks and fixes to improve the way how we store our DCM and Sizmek data. This time we present Sendy API integration. Sendy is a self hosted email newsletter application that lets you send trackable emails via Amazon Simple Email Service (SES). Oh... And there was a hell of a new metrics and dimensions for Adroll, Yahoo Gemini, DCM, DBM, Twitter, Moz, Bing, eBay, Google Analytics, Kenshoo and LinkedIn... When clients need something custom, we go custom! Now we announce only one new thing here. But it is A NEW DATA WAREHOUSE supported by improvado platform. Don't hesitate to contact our support team and ask for this feature if needed. This time we present LinkedIn Organic API integration. This is a part of our ongoing Organic case allowing us to track user-generated unpaid content from client social network profiles that are important for Social Media Marketing. Right now we can load "page_statistics" (for organization-brand) and "share_statistics" Organic data from LinkedIn to get stats about the organization: Followers, Page, and Share time-bound statistics. This time we present our new Instagram Hashtag Search API integration. It allows you to track media that uses selected hashtags and reactions to it. Likes, comments... Looks good for viral campaigns on Instagram. This feature is available only after a special request for now, but we plan to turn it into a regular API integration later. You can learn more here. What else? New dimensions and metrics as always. 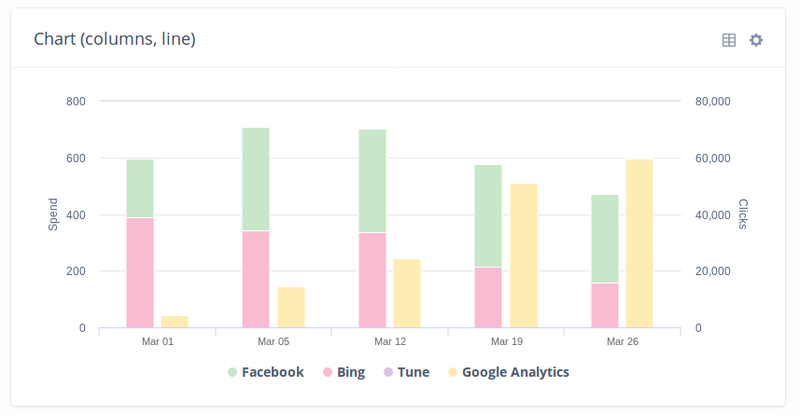 Facebook, DCM, Bing, MyTarget... Oh, just a daily routine. On this week we have some minor improvements in our API fro Google Analytics, Criteo, and DCM integrations and changed the way, how our algorithms process metrics name when loading data to S3 buckets when it is requested by the client. Let's call it a week of small tweaks and fixes. Now we have two more custom integrations - Adobe Analytics and Simpli.fi. This kind of integrations we provide only after a special request, because it is a bit more difficult than typical and common API-integrations, but the fact is: now we can integrate this data sources too if you need it. Also, we have a few more Google Analytics, Facebook, StackAdapt, Twitter, Taboola, Kenshoo, and Adwords custom metrics and dimensions... That was, let's say, "A lot of custom thingies" week. On this week we were improving our PDF export. We always had an option to transform your improvado report into a PDF-file that could be sent by email or printed. Now we added pagination to our PDF export, so different tabs will be placed on separate pages next time when you'll export a report with more than one tab. Oh! And about sending your PDF reports by email: now you can do it automatically! Now you can schedule export to PDF, select how often improvado will create such reports and define email addresses which will receive it - just like you've done it before with scheduled summary export. Just click "report settings" at the top right corner of your report screen. At this week we have finished Campaign level for our AppNexus API integration. Also (as always) we have some new Facebook Pages, Snapchat, Adwords and DBM custom dimensions and metrics for our clients. That were weeks of Backend and Infrastructure updates, so now we have an improved monitoring system for literally everything. And stronger encryption, you know, just in case. And we did good work to enhance the way how our applications deal with those Google Analytics limits and quotas. And also, last but not least, we added a couple of new tools on our admin panel. Maybe, you won't notice this change, but our support and custom success team definitely will. And it is helpful. Hey how! We have two more shining new integrations: Oracle Eloqua Forms API Integration and eBay API Integration! Oracle Eloqua provider is a CRM. It has forms created by users, and those forms have only custom metrics. How convenient that we can upload such fields too. What can we load? Our new eBay integration helps you to load data about Orders, described by order dates, account and order IDs, buyer info, costs, payment and shipping and so on. Off course, eBay can give much more data and we can improve this integration in thefuture, if our clients will need it to be deepened and improved. This week we were finalizing and polishing our huge infrastructure update which we were doing for a really long time - we were carefully transferring our key module, our core, the heart of our product, to its very own beautiful kubernetes cluster. Now, we will be much more agile, scalable and reliable under huge load even than it was before. Our infrastructure team is really happy. On this week we have updated our product to stay compatible with the latest version of Google DFP API (we moved from v201802 to v201811). We have a bunch of custom metrics and dimensions: six new custom DCM dimensions plus one more for Twitter and for GA, and a huge bag with DCM, DCS, Yext and Facebook metrics. At the backend, we have finished a number of tasks improve our data management, made our action log more informative (for ourselves) and moved the monitoring system to the Kubernetes cluster. We entered the new year with inspiration and willingness to continue improving our product. There are three new Google MyBusiness dimensions for tracking Local Insights and Phone Calls metrics with different breakdowns and two new Twitter dimensions: campaign_by_gender and campaign_by_age for now. Oh, and we have a bunch of new Appsflyer Master API, Custom Google Analytic, Facebook and Custom DCM metrics for our clients. 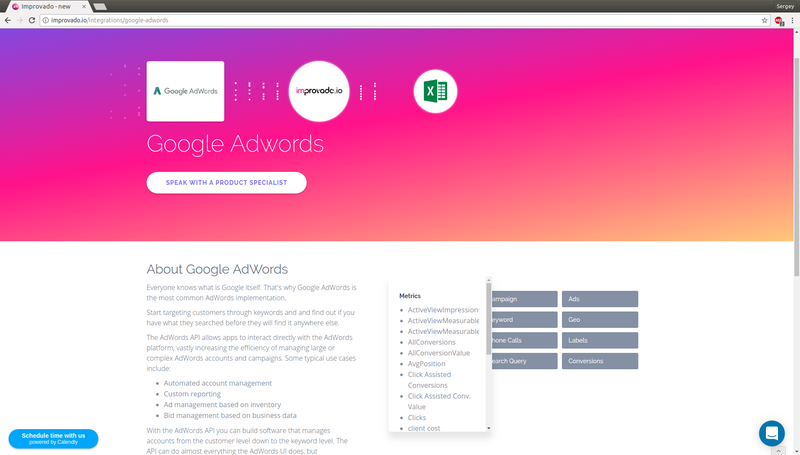 This week we have added integration with one more Google product - Google MyBuisiness. ‍Right now we have only one dimension - location_insights, but we are already working to add more. Also, we have improved our Facebook integration: Ads_Creative dimension now can keep info about Image and Destination URLs that were used in your ads. LinkedIn "Creatives" dimension and Adwords "campaign" now can also save info about advertisement budget in a new metric called "Budget". At this week we were improving and optimizing our SQL-access module to simplify exporting improvado data to other BI tools and tweaked postprocessing components and dynamic metrics calculation a bit. First of all, we have Salesforce account integration now. ‍We can load salesforce's standard fields easily, but custom fields created by you still need some attention and we will ask for additional information from you to make it work. Second one is Facebook Pages Posts Organic data integration with two dimensions: Post and Page. ‍We can load historical data in Page dimension, but Post dimension is lifestream, providing only about a current day. Also, there are some custom DCM, DBM, Yext, Tune and LinkedIn dimensions and metrics for our clients, as always. At this week we had mostly custom, client-specific features and minor tweaks on our whitelabel portals, but that are our small secrets. Also, there are some improvements on our backend for parallel processes optimization. At this week we have started the huge story of Organic data integration and aggregation. Organic data - user-generated unpaid content from client social network profile presented as page and post data with organic metrics like likes, shares, comments, etc - is an important and large part of Social Media Marketing. Another important change at this week was our further improvement of the rebranded Amazon integration. We were creating new Campaigns, Adgroups and Keywords dimension, which are combining data about Sponsored Products and Sponsored Brands Campaigns, Adgroups, and Keywords. At this week we have changed "This month" date range preset for our reporting UI. Previously it was from month start day to month end day, now we can use also range from month start day to the current day. On the backend, we improved our discrepancy protection and advanced databases monitoring instruments. What's new this time? MyTarget API migration! Since December 1 MyTarget API v1 is no more. But we already have integration with MyTarget API v2 - we have finished it this week. News on MyTarget website and their video describing MyTarget changes may be useful for you as well. Also, we have some improvements in YouTube integration logic, trying to emphasize the difference between data gathered directly from YouTube and AdWords YouTube data. Oh... And we have a number of custom metrics, dimensions and email integrations for our clients. As always. This time we have added a CSV-export option (similar to Table widget's one) for our Comparison Table widgets. Sharing results of your surveys will be a bit easier. At the backend we have finished a huge chunk of optimization tasks, implementing a new version of loader and postprocessing logic. It gave us almost fivefold estimated performance boost on some instances, which will allow us to keep working stable and reliably under the pressure of constantly growing data flow. At this week we added a new API integration with Active Campaign - a tool for email marketing, messaging and marketing automation. For now it has only one dimension - Campaign - but it provide a dozen of Active Campaign metrics for you. This week doesn't seem rich in updates - there are just a few backend updates for better stability and monitoring. On this week we were polishing our updated Amazon integration after Amazon rebranding. You always want to be sure that everything works OK after such important changes. We have also added a new API integration with Kochava - the platform for mobile attribution and analytics. And - like literally every week - we have new custom solutions for our clients. ‍"Here, you see, it takes all the running you can do, to keep in the same place. If you want to get somewhere else, you must run at least twice as fast as that!" This week gave us a small update on UI convenience. Now if any of bindings were paused, the "Report data sets" list in the "Edit Datasource" menu will warn you by special pause icon. Clients, who work with our CallTrackingMetrics widget, will also see some improvements with metrics selection process. We will keep tracking all possible changes. We have some new features now. Now we can show image previews in ad_preview tables. We have even created a new metric type (Image) for this. We do our best to fit client's expectations, even when clients need more than typical integration. We have some new features now. 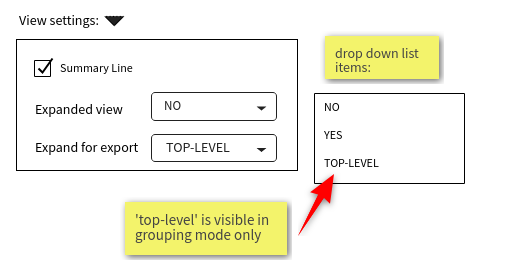 Look at your Table widget settings - there will be an option for simple and user-friendly CSV/XLS export. It will allow you to load your table separately without exporting the whole report (if you don't want it to). Also, we added new functionality for dimension widget templates. Now such Template automatically transferred info about Selected data sources and Selected metrics so the user should specify just account name. On the Backend and Infrastructure side, we have a few AutoScaling improvements to make improvado work better under the high loads. This week we developed a custom Integration with AppsFlyer Master API. It is available for some of our clients now, but we can provide it for others after a special request. Oh, and custom metrics, custom dimensions, everywhere! That was a week of custom solutions for our clients. Facebook, DCM, DBM, Kenshoo, LinkedIn... Literally we have dozens of new custom metrics and dimensions. At this week we have a number of UI improvements. We added some targeting information on accounts connected in Add Lineitem menu and a possibility to add Actual Change columns at Comparison Tables. This was a week of API changes. Criteo has deprecated their old SOAP API and forced a new REST API, so we had to change our Criteo integration too. All new connections will require a REST API token. Clients already connected to Criteo will have old connection functioning and data loading, but we recommend to reconnect your account to Criteo via new REST API to avoid possible issues when Criteo will finally shut down their old and deprecated API. Also, we have improved our Google DCM integration (migrated from V3 to V3.2 DCM API) and this doesn't require any actions on the client's side. Oh. And we have migrated our product YouTube integration from YouTube API v.1 to v.2 Hurray! Also, we have finished a huge pack of custom DBM, DCM, Twitter, and Facebook requested by our clients. Facebook stabililzation: we improved Facebook API usage in our system. We added "Lifetime" date range options for widgets on our reporting platform. Add Datasource menu now asks a user to select an upload time for DBM reports, and also our Define metrics menu will work a bit faster. At the backend, we set up multiple health checks pdf exporter server instead of single and optimized our database queries to lover load on databases. ‍Previously we had a custom solution to pull Sizmek DSP data, but now it is a typical API integration available through the Improvado UI. Also, we added Age and Gender dimensions for Bing integration and set up a new custom integration with Quora. For now, it is available only by special request, but we will improve it and make it more accessible in the future. We have improved our reporting UI and made our widget creation menu more clear and intuitive, with better item order and integration icons. Now you can choose which dimensions to use for Tables and Stats widgets in a more comfortable manner. We added new metric ("Publish Date") to Twitter "Promoted Tweets" dimension, "Add to cart" and "Add to wishlist" for some Facebook dimensions, few client-specific custom metrics and dimensions for Facebook, Hubspot and DBM Trueview. But the most important thing is our new way to show ad_preview data - now improvado can show ad preview with mp4 videos, not only png images we had before. Custom features are still features. And this week we have created two white labels for our clients. Is anything more custom than a whitelabel portal? We have also improved Comparison Table widget stability. After adding for new integrations last week, now we concentrated our efforts on creating custom solutions for our clients. Dozens of new Facebook, Adwords, Google Analytics, Sizmek, and Mixpananel met their new users. Adwords didn't send us "Eligible impressions" metric directly, so we created a formula to find it as a new calculated metric. ‍Also, this week we have improvements in Yandex Direct API client, AppsFlyer dimension loader and Bing connection API, in order to establish a better and more stable connection with those data sources. Our efforts this week have been focused on new API integrations development, but we also have some updates giving us further UI test improvement and backend monitoring system's tweaks. On this week we added the "Expand" option for dimension table widget and changed text warnings in the Edit data sources popup to make the process more clear. Saving button, filters and dropdown lists in widgets were tweaked to work more smoothly. We have set up new UI automation tests for PDF export server to make it more reliable. On this week we updated our Yandex Direct integration to use the newer version of Yandex Direct API both for campaign and dimension level data. As usual, we also have a bunch of client-specific and custom dimensions for DCM, Adwords, and Facebook. On this week we have modified "Add widget" dialog to respect dimension groups and implemented dimensions grouping in the table widget's dimension selection menu. Secondly, we improved our CSV upload with PieChart display type. Backend operations this week were oriented on network and security enhancements, more reliable SSL certificates for our site and so on. This week we were working on adding new integrations and dimensions. We have a whole new integration - HubSpot - and there is another one - Google Search Console - which is almost done. Also, we have implemented literally few dozens of custom dimensions and metrics for our specific clients to improve their Facebook, Adwords, Sizmek and DBM experience. This week was truly rich in integrations and metrics improvements. Also, we have added warning dialog for LinkedIn accounts without any campaigns that could theoretically cause some issues and improved our widgets with better API for saving options state. Finally, we have enhanced the way our database stores users preferences. This week we were working on backend improvements, better health checks, and enhanced monitoring to make our services better. Also, we have a new and better way to store and operate custom metrics. Also, we have added new metrics to "trueview_standard" DBM dimension for everyone and new Linkedin, Twitter and FB custom dimensions for specific clients. Our Frontend team set up a new external (CSV/GDocs/XLS) import provider and improved API methods to add/remove widgets from the report tab. Backend improvements allowed us to use fixed metric types querying in Define metrics processes and ad a default date range to tab info. This week our integration team, improved Sizmek MDX Integration and increased DoubleClick Bid Manager API quota. Also we have few new custom integrations for our client and a new LinkedIn breakdown. Our Frontend team set up a new Tabs option "Week starts on" to fit the traditions of different countries. Now user can decide when the week begins, e.g. is it Sunday or Monday. Also, at the backend, we were working on the improved testing and monitoring system. And we rebuilt Adwords API to work with the new version (v201806) due to the current version deprecation. Also, we have started API version upgrade for Adwords from ver. 201710 to 201806. Now we have finished further report templates improvement. Improvado will no longer have access to the metrics above. However, historical data will continue to be available. This week we were mostly health-checking and improving our existing integrations: Kenshoo, Taboola, Facebook, ViHub, etc. This week we improved our algorithms for Google Spreadsheet creation. For example, now we can use Product name instead of Provider name for loading Spreadsheet. 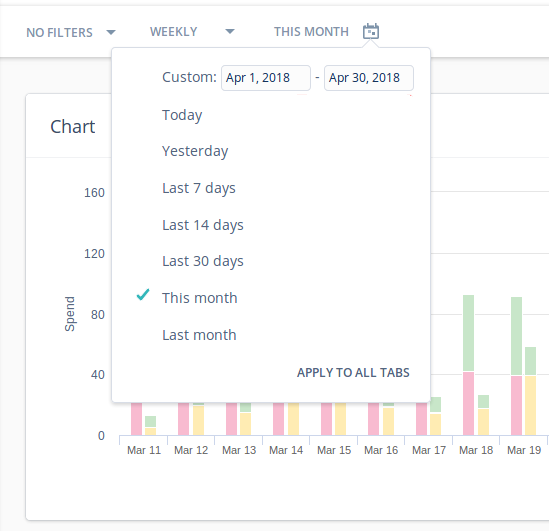 Our reports tab now have new "exclude today" option for the time period - one more option to make time settings agiler and more customizable for client's needs. 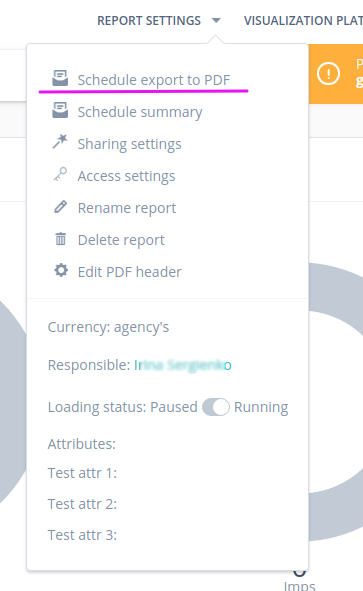 Now you can see which reports were shared with other users and how: we have a new column "Shared by" in the report list. Also, on the Your Team page, you have a list of reports shared and users who have access to them. Learn more. Secondly, we improved our template functionality. Now you can add data sources to your templates. This data wouldn't be updated, but you will be able to map metrics and set up formulas in the template before creating actual reports. This week we have set up few custom Marketo, Zendex and P2 integrations for our clients. From this week we can set up multiple time periods in Chart widgets. You still canгyse this charts with any time grouping like by week, month, etc. New week, new enhancements on our widgets. Now PDF reports will include date range, grouping mode and filters settings from the original tabs. Also, we have a number of API improvements for order priority optimization. Also we had a number of new researches to avoid any possible data discrepancy or downloading issues. We added new groups period for reporting and improved columns width recalculation in transpose mode. We added new functions on our administration panel, so it will be easier for our support team to help you with Custom widgets. At the backend, we added enhanced Roles and Permissions capability for backend API and we also improved CSV import for Pinterest data. This week was concentrated on client-specific integrations: we added few new Facebook and Instagram dimensions and breakdowns for our clients. Also, we improved our S3 import functions. We added some new dialogs and error messages to our reporting platform to stay sure that system better explains itself to the user. Also, we created a new Auto height function for half size widgets to make these ones look better for you and your clients. At the backend, we implemented a new set of test automation tools which allows us to enhance testing quality for our future features. METRIC_RICH_MEDIA_VIDEO_FIRST_QUARTILE_COMPLETES - The number of times a video has been played to 25% of its entire length. METRIC_RICH_MEDIA_VIDEO_MIDPOINTS - The number of times a video has been played to 50% of its entire length. METRIC_RICH_MEDIA_VIDEO_THIRD_QUARTILE_COMPLETES The number of times a video has been played to 75% of its entire length. METRIC_COOKIE_REACH_IMPRESSION_REACH The number of user cookies reached. Also, we improved our S3 integrations for those clients who prefer to keep data on S3. We added new features to our reporting platform to allow Stat summary widget for dimension level data. And from now you can select a report tab for PDF export. Also, we have minor UI improvements to show username and email notifications. It will be useful for people, who work with several accounts simultaneously. At the backend, we implemented few database improvements to make it even more reliable. This week we were improving our existing integrations. We added a few more Google Analytics dimensions and also new LinkedIn metrics for 25/50/75/100% video views. Again, we provided a few more custom, client-specific Facebook dimensions for our partners and clients reports. This week we improved our PDF export, now you can choose a report tab to save as PDF. Sorting in reports tableы also has been changed slightly. There are some improvements in our UI, rephrasing widget creation dialog and updating integrations icons. At the backend, we improved our APIs to enhance widgets performance and changed data formats for dimensional data. 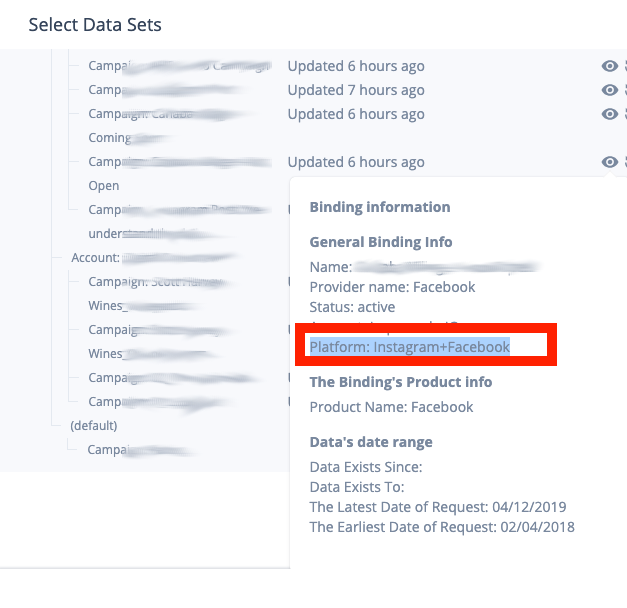 We are always saying, that we can provide custom, client-specific products, and this week we were adding a lot of new custom Facebook and Adwords dimensions for our partners and clients reports (including dimensions with dynamic metrics). At the same time, we improved Adwords Campaign list update mechanism. This week gave us a lot of changes and improvements in different areas. We changed our Table widgets to avoid duplicating functions: Campaign Comparison Table was renamed and combined with the Campaign Table widget. All widget functions work as before. No other functionality change was being made at this time. You don't need to recreate widgets or do anything else to make use of the new widget changes. We improved our Binding Info menu - now it allows you to choose an account when adding new bindings. Enhanced Binding Info window also shows which account is used for each binding. We added the possibility to show comparison column for any numeric metrics in dimensions widgets, changed sorting and columns order in Data Tables, new filters in Chart WIdget, edited some menu texts and even added a new currency symbol (for British Pound)! At the backend, we improved our APIs, which supports this functions and improved encryption to protect our data better. We were working to make our existing integrations better. We improved our DCM Creatives tables and added Campaign's fields for Creatives report type of LinkedIn Ads. Also, now we can pull in Roll Samples metric from Kenshoo and get a step closer to the ideal depiction of an FB "Reach" metric functionality (Facebook itself sometimes tend to show this data in a very specific way). Possibility to rename the product. Also, we improved filters type in the URL field. At the backend, we added an API for manual google spreadsheet updating. Also, we changed filters window for the Instagram data source. At the backend, we improved loader database monitoring. We were working on adding new integrations this week, so now we can integrate your Adition data. 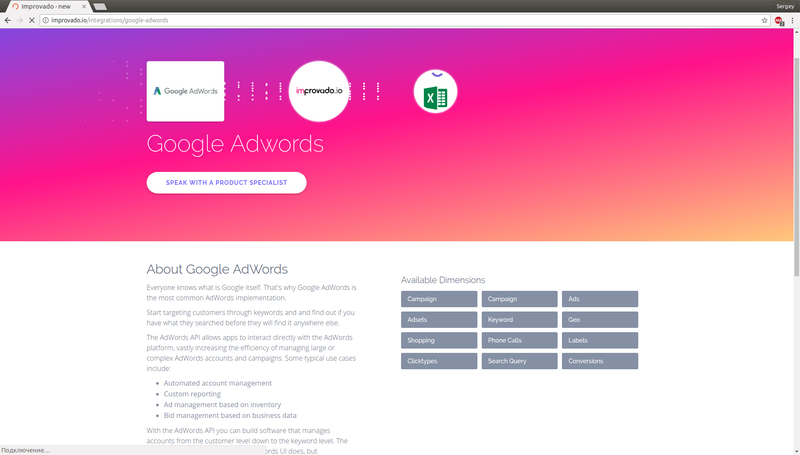 Also we added Geo dimension to Adwords, and improved Facebook Geo dimension usage. Refactored the Define Metrics window to make metrics binding and saving options more clear and user-friendly. Continued health checks and upgrades on our backend and infrastructure to ensure the best reliability in all circumstances. On this week we were working on improving our existing integrations. 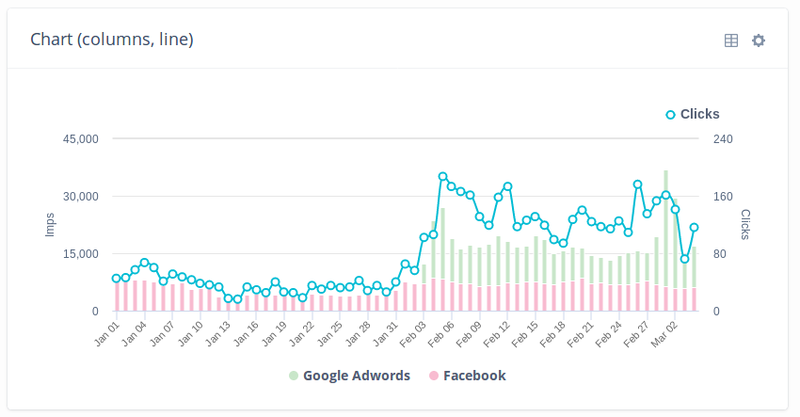 We added new Facebook metrics - Event Responses metric at the Campaign level and Facebook Attribution at Ad level. DCM Post-click Revenue and Post-view Revenue are accessible now as lineitem. We are always looking for new integrations and this week we were researching Adition integration possibilities. We continued our dimension widgets improvement, now we added Group period options. Dimensional data on date ranges (monthly, weekly etc) option is available now for some of our clients. With all that dimension loader optimization we did last week dimension widgets and spreadsheets loads faster. Also, we added an alert message for "Paused" reports, so this report status will cause less confusion now. On the backend, we provided health checks for our whitelabels database and a number of optimization tweaks. We added grouping mode to dimension widgets. It works the same as in campaign table: user switches filter/grouping option on the top right corner of the widget creation menu and then set up filters which will define the rules for including data sources into a group. Also, we added a new type of filters for text fields: "any from the list" which will help to filter by the list of campaign names or data providers. Now we are saving dates range and its name in report tabs. Date range will be recalculated when user opens a report and it works the same way for all types of range except custom one. 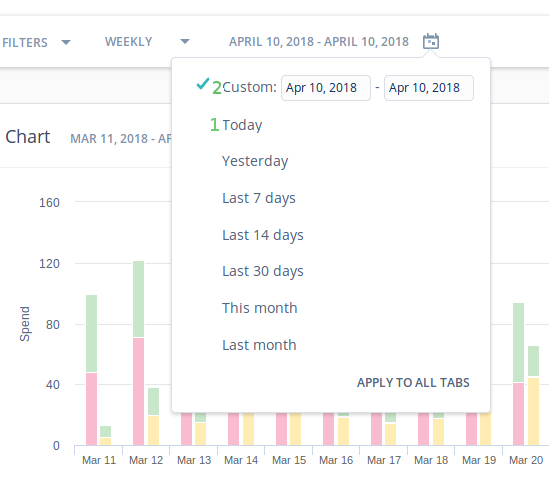 If the user wants to set one date range one time and save fixed dates instead of recalculating each time, they can click "today" and then "custom" for use auto calculation one time. We are constantly updating not only our product but also the ways how you could learn more about it. There is already a lot of information in our Help Centre and Integration list, but we are adding more. Now you can see a list of dimensions and metrics available for any integration we have implemented. Dimensions are displayed as tiles on the right side of the integration page. You can open the list of metrics included in the corresponding dimension by clicking on a tile with dimension name. We need to mention also that only implemented integrations have this option, we aren't ready to describe every integration in "Coming soon" section to avoid misleading our clients. This week we were working on improving our existing integrations. We added new Metrics for Adwords on Adset level. Also, we added Facebook Ad_preview dimension (some clients were asking us about) and also created a new table to show this dimension. We are always looking for new integrations. On the front end, we added Grouping mode in dimension widgets (a week ago we implemented grouping on campaign level widgets). And there are new rules for the report date range and new Custom Query filter options. On the backend, we were improving our monitoring system to provide faster and more reliable bug tracking to fix any possible issues even faster. Chart widget was modified, so now you can split bar by product. In all other cases, this widget acts the same way it did before an update. We are always looking for new integrations. For this week we were researching DialogTech Integration possibilities.